The Dow is set to open close to 175 points lower. Brace for a wild ride. 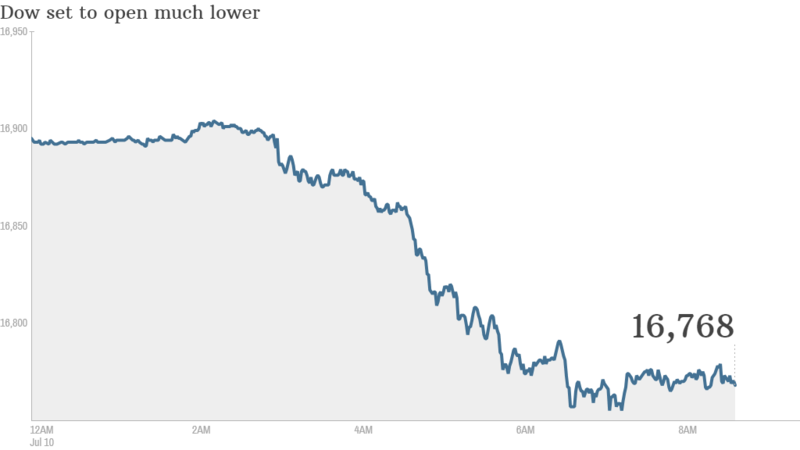 Stock futures were trending sharply lower Thursday on fears about Europe's recovery. It's likely to be a rough day in the U.S. as well. Societe Generale strategist Kit Juckes said that futures were following the dismal performance of European markets, which were being thrown into turmoil by the struggling financial performance of Portuguese bank Banco Espirito Santo. 1. Data on tap: The U.S. government will post weekly jobless claims at 8:30 a.m. ET, giving investors some insight into employment market strength. 2. Earnings in swing: Shares of Family Dollar (FDO) slipped in premarket trading after the retailer reported a drop of 1.8% in same-store sales and a net income plunge of about 50% in the latest quarter, compared to a year earlier. Insurance company Progressive (PGR) will also report earnings before the opening bell. 3. Stock market movers: Airline shares were heading higher after American Airlines (AAL) and United Continental (UAL) provided upbeat forecasts. Shares of Tractor Supply Co. (TSCO) dropped 5% before the open after the company posted disappointing earnings on Wednesday. Overall, U.S. stock futures were lower by about 1%. 4. Market recap: U.S. stocks closed higher Wednesday, bouncing back from losses from earlier in the week after the Federal Reserve reassured markets that it was in no hurry to raise interest rates once it's done tapering in October. The Dow Jones Industrial Average and S&P 500 ended up about 0.5%, while the Nasdaq gained 0.6%. It was the third-highest close in history for the Dow. 5. International markets overview: European markets fell significantly across the board - led by a 1.7% drop with the CAC40 in Paris - after disappointing reports on industrial output raised new fears about the strength of the region's recovery. Investors were also unnerved by news that trading in the shares and bonds of Espirito Santo Financial Group -- the leading shareholder in Portugal's biggest bank -- had been suspended. Shares in Banco Espirito Santo slumped by 16%. Portugal's PSI index fell 4%. Asian markets ended mixed. Markets in Shanghai and Tokyo closed in the red, while Hong Kong's Hang Seng defied the broader trend to finish in positive territory. Mumbai's Sensex posted early gains on the release of the first national budget from Prime Minister Narendra Modi and its promise of sharply higher growth. But the index turned negative later.